Remodeling a bathroom can be quite a challenge, especially when there are so many design options to choose from. Yet creating the ideal bathroom does not have to be complicated and can be done with a minimal amount of effort. With a bath remodel a good place to start is with the shower, making it the focal point of your design. Nowadays your shower does not have to be the conventional type wrought with a standard shower head and the tinted glass sliding door. 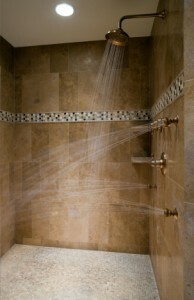 In fact many interior designers suggest adding a soothing spa shower to your bathroom. You can also complement your steam shower with other features such as design lighting, bathroom tile, and cabinetry, and your bathroom will not only be a relaxing spa but it will be more functional. The personality of a shower can be accented by the type of shower head that you choose. There are many shapes and sizes that will fit your needs. With the newest Immersion technology, shower heads come in many varieties such as massage jets, steam shower heads, hydrotherapy shower heads with adjustable body jets , rainfall shower sprays, and thermostatic valves for temperature control. Many shower head features come with an on/off valve control, adjustable body jets, thermostatic valve control, water control diverters, and even some that are self-cleaning. Whether you desire elegant, country, or a modern design, there are a lot of styles and textures to choose from that can personalize your bathroom. There are unique shower heads made of chrome, brushed nickel , antique nickel, oil rubbed bronze, anodized aluminum, wrought iron, antique bronze, granite, and waterproof wood-like fixtures. There are also many types of shower heads such as vertical wall mounts, hand held shower heads, some with directional heads, and some with lever handles. With the latest designs you can also choose whether to mount the shower head back-to-wall or in the corner. Bathroom tile showers are easy to maintain and definitely made to last. The hard yet smooth surface makes it easy to keep clean and wipe down brilliantly. Ceramic tile does not fade, stain, or scratch; making it easy to maintain and lasting for years. There are a variety of tile designs that are available, making it easy to match your décor and style. Tile comes in a variety of shapes, sizes, and color. Ceramic bathroom tile comes in a range of fine art such as ancient Tuscany, African, Georgian, Asian, Country, Seafaring, and Floral; each are unique and beautifully crafted. As well, colors come in many varieties to fit your decorative needs, even white comes in many shades. There are unlimited bathroom tile design ideas out there and the hardest part is picking which one you will be happy with. Along with choosing the ideal bathroom tile you can pick from a variety of shower accessory shelves. Shower shelves can be for functional purposes such as for bathroom items or for displaying a favorite plant that thrives on steam. Shower accessory shelves come in many sizes and widths, they can be two to four tiered, rounded, square, or oval shape. When designing a bathroom, special lighting is a excellent addition. Lighting design can be for enhancing a dark corner, accenting your décor, heating the bathroom, and updating to more efficient light. Lighting comes is a variety of fixtures such as ceiling lamps, wall lamps, waterproof shower lights, and also different colored fluorescent lamps. There is a wide variety of shapes and sizes when choosing what you need for your bath remodel, some lights can even be custom made to fit a special design. When installing any light design it is usually a good time to add fans for ventilation; most ventilation fans are on the same outlet as your light. As well, there are a variety of fans that have adjustable speeds, timing devices, and can be set to come on when you turn on a light. With today’s technology, showers can come with many types of electronic equipment. Along with a steam shower and invigorating jets you can enjoy an FM radio or CD and relax to the music of your choosing. As well for you for convenience, there are hand free phones and microphones available while taking a steam shower. For an added bonus to your spa shower you can get a steam generator, remote control, and even a foot massage. With the extensive selections of spa showers that are at hand you can create the ideal living space the way you imagine it. The decorative choices for creating a perfect spa bathroom are endless. Spa showers come in a variety of shapes and sizes and the quality of the craftsmanship will be enjoyed for years to come. Your design is what you want, whether it be extravagant, picturesque, or inspirational. Your spa shower will bring hours of calm relaxation that will leave you rejuvenated.